Small-footed bats have black face masks that distinguish them from little brown and tri-colored bats. Photo by Al Hicks, courtesy of USFWS. Rapid growth in technical climbing has put rock climbers in the same spots as bats. How compatible are the two? For this study, Loeb and co-author Patrick Jodice, leader of the USGS South Carolina Cooperative Fish & Wildlife Research Unit, paid particular attention to the small-footed bat (Myotis leibii). The scientists did not find any evidence that rock climbing routes were responsible for either the presence or absence of any bat species. Their study was conducted at the Obed Wild and Scenic River in Tennessee, and their findings were published in the Journal of Fish and Wildlife Management. Small-footed bats are tiny and aptly named: they’re just three inches long, weigh about as much as a nickel, and their hind feet are barely a quarter-inch in length. They’re able to roost in the narrowest of crevices and often nest alone. 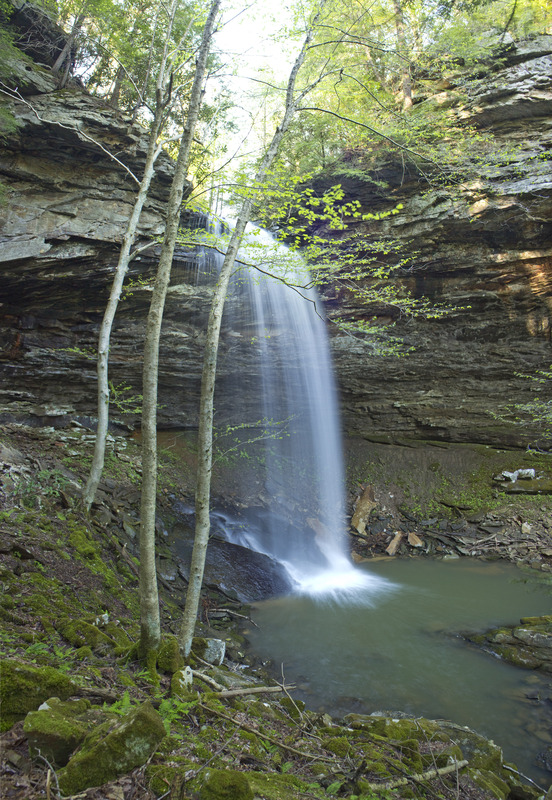 Winding through the Cumberland Plateau, the Obed River offers scenic spots to fish, swim, paddle, hike, and climb. Photo by Jeff Moore. Small-footed bats are fairly uncommon, and like other species in the Myotis genus, they reproduce slowly: only one pup per year. “That’s why bats are in trouble,” says Loeb, whose previous research has examined roosting habitats for other Myotis species, including Indiana bats and northern long-eared bats. Their slow reproductive rates make these bat species slow to recover from threats like white-nose syndrome. On top of that, juvenile survival rates are relatively low. Several southeastern states include the small-footed bat in wildlife action plans or target their conservation in other ways. 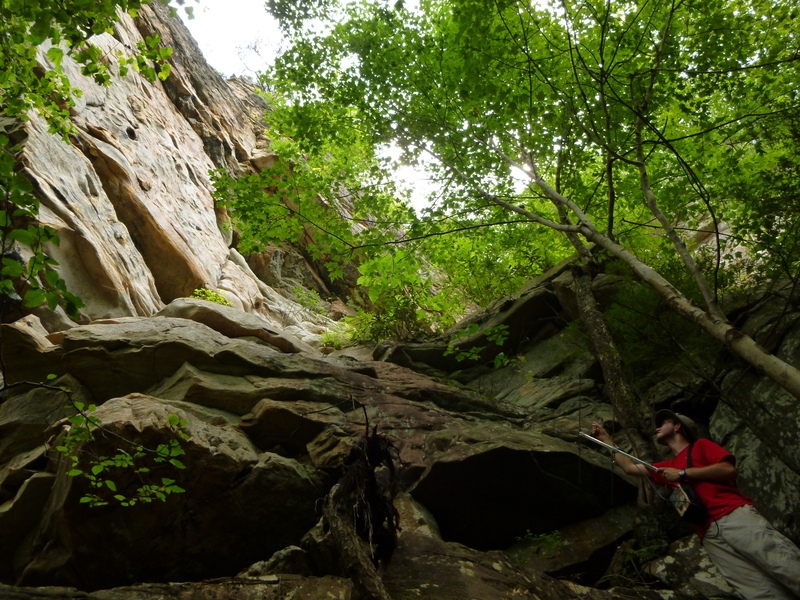 During the summer of 2015, Loeb and Jodice surveyed bats in the popular Obed rock climbing area. Within and just outside of the park boundary are five cliff faces and 475 climbing routes. Routes are clustered, with 40 to 150 on each cliff band. 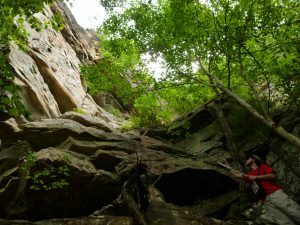 First, the researchers collected data about the cliffs – height, aspect, overhang – along with the presence of other rock material that bats could use for roosts, like boulders and talus. Next, they observed bat activity in areas with and without climbing routes. They used acoustic detectors to record and identify bat calls. Eight bat species were present. The researchers noted the timing of bat passes from before sunset until after sunrise. A previous study documented nine species of bats in this area. Loeb and Jodice trapped four species in mist-nets: big brown, northern long-eared, small-footed, and tri-colored. They attached radio collars to small-footed bats and tracked their roosting locations and behaviors. They located nine roosts, all of which were found in crevices – either cliff faces, large boulders, or in one case, a barn. The bats roosted alone for an average of three nights in one place. Researchers tracked small-footed bats to roosts in cliff faces. Photo by Christopher Fill, courtesy of Clemson University. 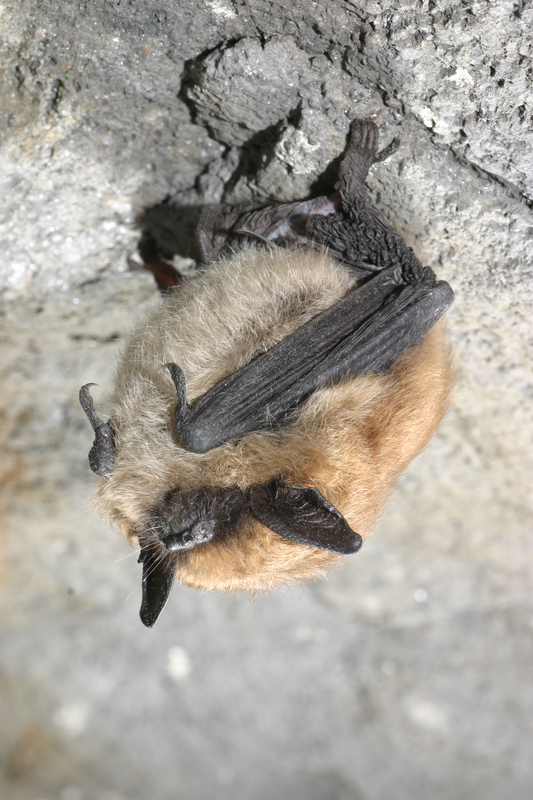 Small-footed bats roosted in both climbed and unclimbed cliffs, as well as in streamside boulders. In the climbed cliff areas, the bats were active later at night than in the unclimbed areas. Cliff bands with climbing routes had higher overall bat activity than bands without. Loeb pointed out two factors that might explain the differences. “First, we had less access to the unclimbed cliffs due to a lack of trails and some areas within private ownership. Second, we found a positive relationship between cliff height and bat activity and diversity. The climbed cliffs were significantly higher than the unclimbed cliffs,” says Loeb. Loeb and Jodice recorded up to 300 bat passes in one night and an average of close to 200 per night. These numbers are higher than recent studies that examined bat activity in forests. “Cliffs are important bat habitat. They may provide protection from wind and predators. Bats may find abundant insect prey up there, too,” adds Loeb. She hopes that their findings will lead to additional studies about bats and cliff habitats. Lots of questions about recreation impacts remain. How important are large structural features like chimneys or roofs? What about the number of climbing pitches, how much time climbers spend on a particular route, and where or how they place anchors in the cliffs? While more research is needed, climbers and hikers can contribute to current conservation efforts by reporting bats and roosting sites to land managers. This National Park Service video has details on how to help.